Stephen Cowan graduated from the Royal Conservatoire of Scotland in July 2006 with BEd Music (Hons). During his time at the RSAMD, he studied Flute with Sheena Gordon, Piano with Lily Geddes and Isabel Anderson and conducting with Dr Alasdair Mitchell. Since graduating he has been actively involved in music making both within local schools and within the community. He is currently Depute Head Teacher of St Joseph’s Academy in Kilmarnock. 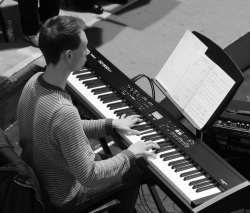 As a church musician, Stephen has held a number of varied and challenging positions within many churches including, for five years, when he was Organist and Director of Music at Fullarton Parish Church, Irvine and responsible for the development of their vast musical resources (instrumental and vocal). Keegan Gordon began studying at the Junior Department of the Royal Conservatoire of Scotland in 2007 with Russian pianist Anna Rastopchina. Also studying clarinet and Scottish music, Keegan performed with several local orchestras and in 2009 won the North Ayrshire Young Musician of the Year award. His keen interest in folk music saw him win the first RCS Junior Department Scottish Music Prize and, with his folk trio, was a semi-finalist in BBC Young Folk Awards. He has also performed at several prominent festivals such as Celtic Connections, Scots Fiddle Festival, Cambridge Folk Festival, Uddevalla Folkmusikfestival in Sweden and performances in Slovenia. Continuing his studies in classical piano performance, Keegan graduated in July 2014 with a BMus (Hons) from the Royal Conservatoire of Scotland under the tutelage of Scottish concert pianist Graeme McNaught and South Korean pianist Sinae Lee. During this time, he premiered a new work at the RCS PLUG New Music Festival and took part in an international project for multiple pianos. As a second study, his interest in folk music led him to study traditional Scottish piano with composer, arranger and pianist James Ross during which time he specialised in accompaniment and arranging. Keegan spent a semester studying at the Gothenburg Academy of Music and Drama in Sweden with Bernt Wilhelmsson where he took part in a Debussy piano festival and performed Maurice Emmanuel’s little performed Piano Trio Op. 11 at Jonsered Manor House. In both 2012 and 2014, Keegan won the Euing Prize for History, Form and Analysis; in particular for his dissertation which focused on Scottish cultural policy. He has performed in masterclasses for several highly acclaimed pianists including Stephen Hough, Andrew Zolinsky, Adriano Ambrosini, Bengt Forsberg, Philip Jenkins and Richard Meyrick. Continuing his postgraduate studies in Edinburgh, Keegan gained an MA with Distinction in Culture and Creative Enterprise from Queen Margaret University with a thesis which examined economic agendas in creative education. Keegan has recently returned to Ayrshire where he works as a freelance musician and accompanist, having gathered considerable experience accompanying the Dreghorn Musical Society, Hillington Community Choir, alongside his teaching work at Biggars Music Practice and Melrose Music School in Glasgow.